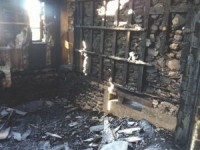 Jake and Donna Burton Carpenter’s sons George and Timothy, are apparently responsible for accidentally torching Mount Mansfield’s historic Stone Hut just before Christmas, after getting the place warmed up for a friend who they thought was spending the night, according to a story in the Vermont Digger. The brothers and a few friends “built the fire up really big” in the wood stove, and brought in some wet wood from outside, which they leaned up against the stove to dry out, the report said. . . A few of the pieces were placed at an angle where the tip of the wood was against the stove and made a ‘hissing’ sound as the snow began to melt against it,” the police report reads. . . The group left the hut and headed down the mountain at 2:40 p.m. About five hours later, they realized the friend they expected to spend the night at the hut didn’t show up. Sometime later, the Hut caught on fire, however, the fire was not reported until 7 AM the next morning by a lift mechanic. The Carpenters have reportedly pledged $100,000 for the restoration of the hut. Pretty expensive way to learn that whole Smokey The Bear “never leave a fire unattended” thing.